From cave paintings to moon landing, humankind has achieved amazing progress based on imaginary models, analysis and control of equilibrium-oriented systems broke up into their constituent parts, such as the deterministic celestial orbits, the invisible hand in market economy, the genetic code of life and the probabilistic atomic particles. Largely due to the computers dissemination in last decades, however, it has been developed a new vision of the real world modelled by complex systems of multiple elements that interact between themselves and their surroundings in an unpredictable and dynamic way, spontaneously regenerating and co-evolving emergent features and adaptive behaviors. In various fields, that has led to breakthroughs in examining phenomena hard to be understood or explained before, such as climate changes, stock market variations, clouds and galaxies distributions, heart and epidemic diseases, natural swarms and shoals, as well as organization and business management. In summary, the dream of reinventing management implies to meet the collective challenge of making our organizations and natural spacecraft most valuable for everyone today and sustainable for the future generations. The number of organizations managed by PDCA-oriented systems and their specific relevant results are some key performance indicators (KPI) that could be used to assess the effectiveness of this hack. 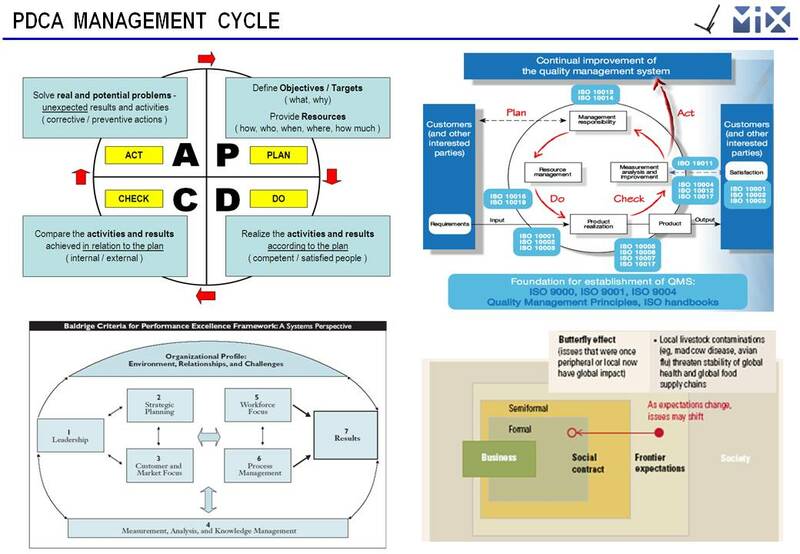 The proposition is to adopt the well-known and proven-effective PDCA (Plan-Do-Chect-Act) Cycle, which has entailed the fundamental tasks of managerial work for a long time, especially in most post-war management systems. Even though related to Management 1.0 tools and processes, the PDCA has an open and renewal-oriented nature that makes it suitably flexible and adaptable to go on carrying out the work of managing throughout successful and competitive organizations, at present and in the future as well. Some key performance indicators (KPI) that could be built to evaluate the effectiveness of this hack are the amount of organizations managed by PDCA-oriented systems (e.g. 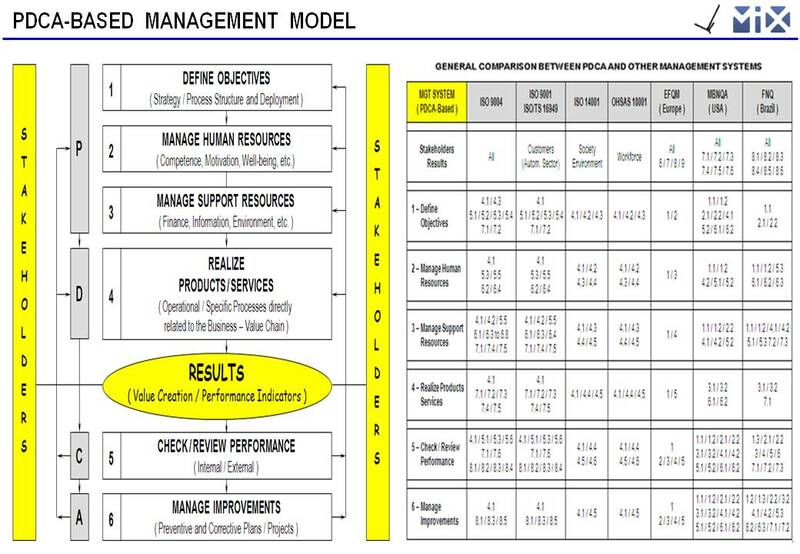 more than 50 thousand users of ISO or FNQ-based management models in Brazil) and specific KPIs relevant to value creation at such organizations (e.g. those of the Brazilian hydroelectrical sector showed in the attached file MVHack.ppt below). In contrast with an ideally predictable and stability-seeking world in classical science, the reality has a long time insisted on instabilities, turbulences, irregularities and other evolutionary arrangements such as natural life, self-consciousness, business organizations and internet communities. Fortunately and surprisingly, a lot of properties and problems emerging from that greater complexity have been tackled by dynamic models where interconnected agents repeatedly perform just simple rules in accordance with their collective integrity and environmental changes. Despite not being exactly the proposed management model (mainly in regard to the focus on results) and the inevitable pitfalls in real life, the worldwide knowledge and use of ISO standards may be considered as an opportunity to continuosly regenerate and integrate management technology yielding whole benefits greater than the sum of the various organizations or businesses that evolve together to adapt to environmental changes or pressures. 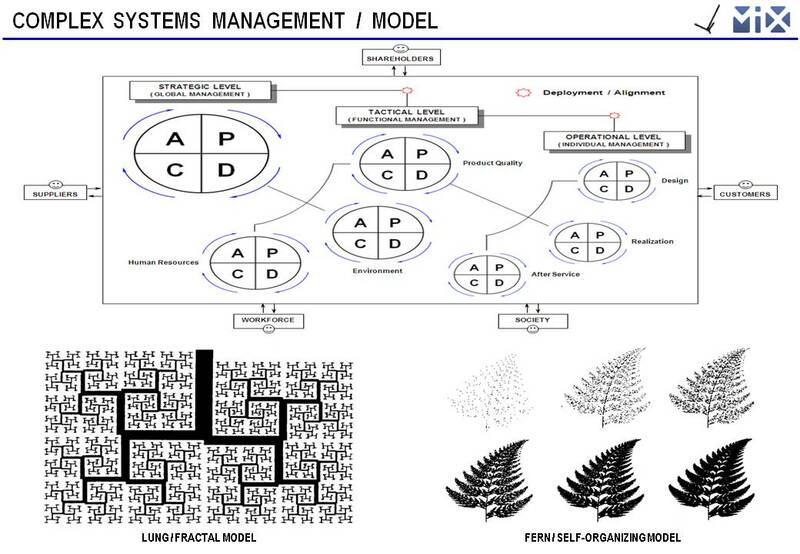 Other cases of such possible (co-)evolutions refer to (self-)organized efforts in disseminating (self-)similar PDCA management tools in Brazil, for example the Management Excellence Model (MEG®) which see organizations as living entities in interactive and interdependent complex ecosystems. This model has been used and developed as the basis for the Brazilian National Quality Award (PNQ) conferred by the National Quality Foundation (FNQ) - a “butterfly flap” in 1991 that has already trained more than 45 thousand people in world class competitiveness and relies on a dynamic and open community of voluntary work, study, debate and shared knowledge, experience and good management practices. By the way, the recent and substantial raising of foreign investments in Brazil has not as sole reasons its large consumer market governed by a charismatic ex-metallurgical worker who became president nor the chinese appetite for commodities like iron ore. Moreover and more sustainable, it also counts a “silent revolution” in the search for excellence that has aligned many Brazilian initiatives in the entire socio-economical landscape, such as political leaders who have applied a “management shock” to governmental issues and a network of thousands of organizations (private and state-owned, large to small-sized, over 10 million people) committed to outstanding performances through the FNQ’s Management Excellence Model - e.g. the hydroelectrical sector, responsible for almost 80% of the country’s energetic matrix and with five PNQ laureates in last three years. Einstein once said that past and present people, similarly motivated, as well as their acquired knowlegde, are worthy of being treated as friends. On the other hand, the Argentinean writer Jorge Luis Borges compared a book to a lot of sheets with dead symbols, that nevertheless wake up their authors when they are read. Dear Mr. Cotrim Arabe, your interesting essay addresses an interesting subject, the complexity of management. We have common approaches (I was licensed by the European Foundation for Quality Management to present their EQA in company, I introduced ISO 9001 in company and in government programs, and I have taught strategic management at post-graduate level. I consult with senior management on strategic and organizational effectiveness. Margaret Wheatley’s book was inspirational). Of course, there are differences (I did read Gleick, but I do not claim to understand the chaos theory, and I did not get close to the fractal theory). In the following lines, I would like to suggest some points where my Platform of Management-Innovation may complement your approach. For details, allow me to refer you to my latest book “Innovate out of Crisis - Second (and revised) Edition” Create Space 04/2010. I suppose that we can agree that management-innovation requires a good reason to change, a clear method to follow, and a critical mass of people pushing for change. Hereafter, I will focus on the method that should show the way to attain management-innovation. In order for people to understand how business-value is created/destroyed in their organization, they must look at the interactions between 3 business value-drivers, namely the 5 strategic resources, the 2 rings of management processes, and the 5 significant-stakeholders. You may remember that Total Quality Management taught us to look at the interactions between processes to find areas for improvement. Here we are dealing with the complexity of the management-system, and things are a bit more complicated. The first layer of managing complexity looks at the interactions between the 3 business value-drivers for a high-level view of the gap between the envisioned desired state and the current status. This enables the leadership to formulate the needs of management-innovation. The second layer provides a detailed breakdown of the 3 business value-drivers in order to get into the details of the interactions inside/out and outside/in. This is where value-innovation projects are planned. The third layer involves the interactions between strategy and operations, between the future and the present. Business-value is created on the 5 strategic resources. The Organizational Capital – one of the 5 strategic resources - is the cornerstone of my subject model. Inspired by McKinsey’s The 7 of the organization, it encompasses the strategy fundamentals, the style of the leadership, the structures of the organization, the systems of the management, the shared knowledge. As you see, complexity starts here, and failure to deal with it systemically will impair programs of management-innovation. For brevity’s sake, I will only touch hereafter on the systems of management, and on the structures of the organization. (See Chapter Three in my book). The systems of management feature the 2 rings of management processes, namely the 4 steering or strategic processes entrusted to the business-leaders, and the 4 business-processes delegated to the operations management. Deming focused his P-D-C-A on the business-processes. Today, the big, big problem is to connect the steering and the business-processes, the planners and the doers. (See also my article “Connect the Planners and the Doers”, Quality Progress 2001) Obviously we need the planners and we need the doers, and most importantly we need to connect the two. “The Model of the Two Rings” (M2R) presents my solution to this problem, and it responds to the European Quality Award’s call for a fitting process of policy deployment. M2R expands on the Japanese Hoshin Kanri. M2R provides transparency over the entire roll-out of the management processes and the strategic resources therein employed. Thusly, everybody can see the distribution of the roles, the responsibilities, the resources. Everybody can see where they stand and where the others are going. Motivation is a group thing. I remember that, when I was rowing at the university regatta, seeing where we stood and where the other outriggers were moving, I can tell you, that was a powerful motivation. (I refer you to my Chapter Three). M2R also includes the reviews/evaluations, and the rewards. The reviews and the rewards are tangible levers of motivation. As concerns the evaluation, I cannot stress enough that it must consider the performances on total resources that encompass both the tangible as well as the intangible assets. (I refer you to my Chapter Six where you will find the method that I advocate to measure the return on all the resources invested, the tangible as well as the intangible assets). Let me point out that M2R and the other best-practices that are featured in the Platform of Management-Innovation - provide the self-referential that - according to Margaret Wheatley - are a prerequisite of efficient self-managed structures. I do not believe in organizational effectiveness without some form of hierarchy. Leadership implies some form of hierarchy, be it a formal or an informal one. We competed in the university regatta on an out-rigger four with helmsman. There is also an out-rigger four without a helmsman, but that requires a highly skilled team, and the first oar acts as the helmsman. However, when you take a larger group, such as the out-rigger eight, there are just too many oarsmen to keep the course without a helmsman. There has got to be someone that sets the objectives, the pace, and that allocates the resources. There has got to be someone to whom the objectives are assigned and that leads the team to elaborate and to implement the strategies. And so, the issue – in my opinion - is not hierarchy as a concept, but rather establishing the kind of hierarchy that suits the organization and the situation the organization is in. Moreover, the hierarchy must trust the people and be trusted by them so as to foster rather than to stymie commitment-cooperation-collective creativity. (In my Chapter Three you will see how the targets/means are deployed though 2-3 levels in the company. Corporations that encompass several companies have to add an additional level of deployment). Modern management is carried out mainly on a project-by-project basis. The teams that work on projects need a team leader, possibly a primus inter pares, who coordinates, motivates, and gets the necessary resources inside/outside the organization. On top of the projects, there has to be a person or a group that sets the priorities in terms of objectives, timing, and resources. Increasingly, we deal with pluri-disciplinary teams, large teams, occasionally teams with changing membership, and these teams require a coordinator. All that matters – in my opinion - is that the distribution of the 5 - i.e. of the roles, the responsibilities, the resources, the reviews, the rewards – allows for sufficient flexibility and responsiveness so as to make the most out of shifts in the business-environment. The leadership must ensure that communications are effectively managed on the vertical (top/down, bottom/up, and top/down) and on the horizontal (across the functions/business units). It is the role of the leadership to establish the suitable management-system in order to excel in creating business-value with and for the significant-stakeholders. In my Platform of Management-Innovation I advocate a few principles and a few best practices that should prove valid for any organization. However, I am disinclined to propose a single model to suit all situations. If interested, you can find my aforementioned book on amazon (under US$ 30 at amazon.com). I will be pleased to receive your questions/comments after you consulted my work. Kind regards, Willy A. Sussland, Ph.D. Thank you for your interesting and detailed comments. I am going to learn more from your book, but considering what I have already read at amazon.com and in your six hacks, I totally agree with you that we have common approaches such as the business processes based on the PDCA, the strategy deployment and necessary integration along the different organizational levels, the performance evaluation system, the significance of the various stakeholders and so on.